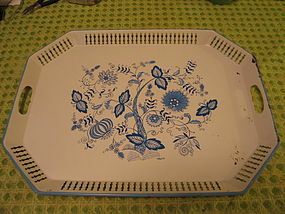 Vintage metal tray with blue onion design. It is signed Maxey. It measures 22 x 16 inches. There are no dents, but does have areas of loss to the finish. I need your zip code to calculate the postage. Don't know if this would be considered acrylic or lucite. The brass is solid. It measures 9 inches in height, with a base width of 3 inches. There is no damage. 2 are available and priced individually. 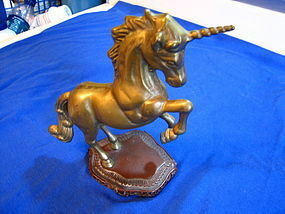 Vintage brass figure measuring 7 1/2 inches in height. It is not marked, but looks and feels like solid brass. The base looks like Bakelite, but don't think it is old enough, so would think it is some type of resin. It has no damage. I need your zip code to calculate the postage. 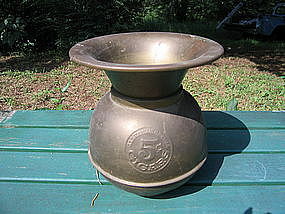 Vintage spittoon or cuspidor measuring 10 1/2 inches in height and 9 inches across the top. It embossed with All Famous Havana's 5 Cent Cigars on the both sides. The surface shows oxidation and a few stray drops of paint. There is a dent toward the base and can be seen on the lower right in the photograph. I need your zip code to calculate the postage. I do not know if it is old enough to be considered vintage, but it is not new and has been used. The bottom is felted. It is 10 1/2 inches in height and 5 inches in width. 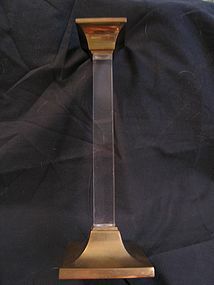 The base measures 4 3/4 x 2 1/2 inches. 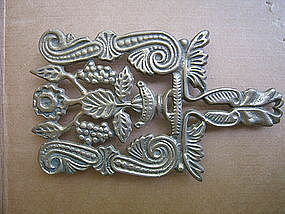 It has never been polished and shows some darkening and oxidation. I need your zip code to calculate the postage. 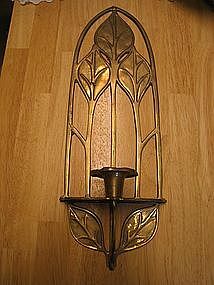 Brass sconce measuring 18 x 6 inches with a depth of 4 inches. 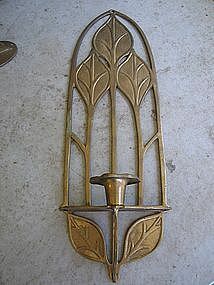 It is not marked, but appears to be solid brass. It has never been polished and shows some darkening and oxidation to the surface. I have two of these wall hanging candle holders and priced individually. I need your zip code to calculate the postage. 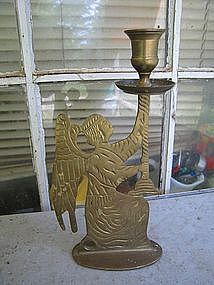 This wall hanging candle holder is not marked, but looks and feels like solid brass. It was manufactured in India. I don't know if it would be considered vintage, but it is not new. It measures approximately 18 x 6 inches and has a depth of 4 inches. There a few small areas of darkening to the surface. Two are available and priced individually. 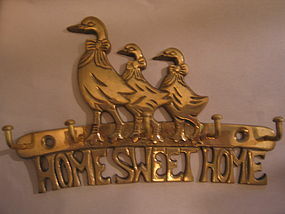 This brass trivet is not marked, but it reminds me of the cast brass objects manufactured in Italy. It measures 7 1/2 x 4 1/4 inches. There are 4 supporting feet. The rubber tips are showing age related wear. 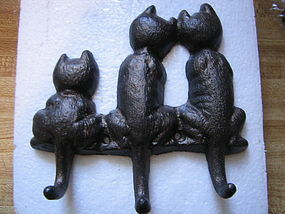 It would fit into many kitchen decors, including a Tuscany theme. I need your zip code to calculate the postage. 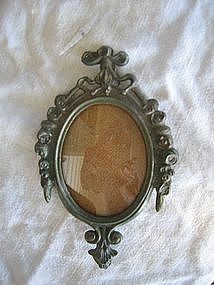 Vintage frame measuring 6 1/4 x 4 inches. It is the ideal size for a miniature. The glass and backing are included. The metal shows age related darkening and oxidation. 3 of these are available and priced individually. I need your zip code to calculate the postage. 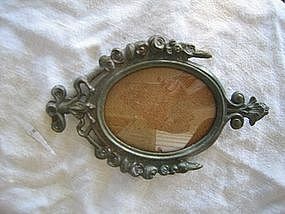 Vintage picture frame manufactured in Italy. The exterior measurement is 6 1/4 x 4 inches. A print or photograph size of 3 1/4 x 2 5/8 inches can be used. The glass and backing comes with the frame. There is a loop for hanging. There is age related oxidation and darkening to the metal. I have 3 of these available and priced individually. I need your zip code to calculate the postage. I've never been sure if this is a box, cigarette holder or candle holder. 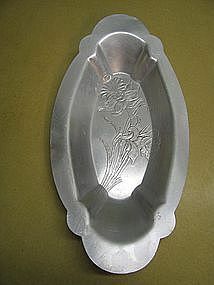 The lid or top piece has been used as a candle holder. The bottom piece may have been intended as a holder for a pillar candle with the lid to be used as a snuffer. It is one of those items that can be used for whatever purpose needed. With the lid in place, the height is 6 1/2 inches. There is no damage. I have 2 available and they are listed and priced individually. I need your zip code to calculate the postage. Jonquil design in center. It measures 13 3/4 x 7 x 1 3/4 inches. There are no dents or warping, but as you can see there are usage marks to the surface. I need your zip code to calculate the postage. 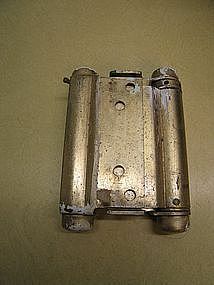 Brass hinge measuring right at 5 inches in length and 3 1/2 inches, when in the position shown in the photograph. It weighs 2 pounds. There are paint splatters and age related wear to the surface. 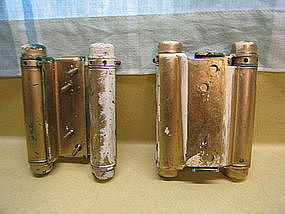 The photograph shows 2 hinges to see the front and back view, but the price is for one hinge. I need your zip code to calculate the postage. 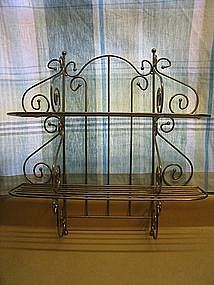 Vintage set of wall mount shelves measuring 19 1/2 inches in height, 18 1/2 inches in width and and 5 1/4 inches in depth. 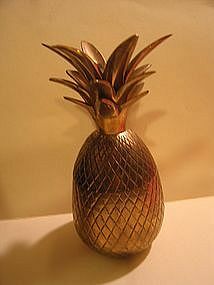 I don't know if this brass or a metal base with brass finish. There are no dents or warping, but shows age related wear to the finish. Additional photos are available by email. I need your zip code to calculate the postage. 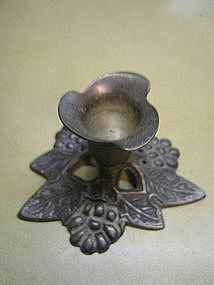 Vintage metal candle holder manufactured in India. I am not sure of the composition of the material. It measures 4 1/2 inches in width and 2 3/4 inches in height. It has been used and has residual wax. I need your zip code to calculate the postage.